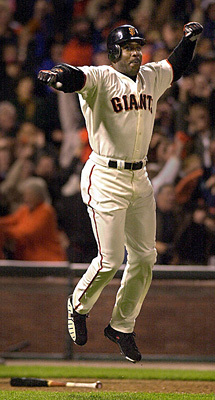 After reaching a career home run total of 495, Barry Bonds went on an unprecedented tear, going deep in five consecutive games to reach the magical 500 home run plateau. The historic homer came when his Giants needed it most, with the Los Angeles Dodgers winning 2-1, in the bottom of the eighth inning, Bonds slammed a 2-0 fastball from reliever Terry Adams into McCovey Cove giving the Giants a 3-2 lead, an eventual victory, and a spectacular five-hundredth career home run. "When I hit it, I couldn't believe I hit it,” said after the game. “Everything was in slow motion. It looked like it was stopped in midair. After I saw it went past those people I thought, 'Wow! I did it!'"